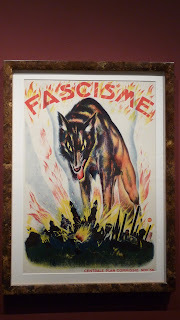 A poster from the German Expressionism room at LACMA (I thought it was really funny). Bunny and I went back to LACMA to see more paintings, her favorites included: Clyfford Still, Richard Diebenkorn, Miro, Jasper Johns, Richard Sera, Elsworth Kelly, Georges Braque, and Alexander Calder. After the museum, we got home and my dad had made barbeque, and we looked at old slides of baby Johnny with my dad - until the projector got jammed and we had to figure out how to take it apart. After that hour or so of tinkering, we looked at more slides.